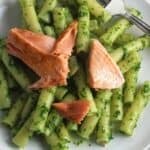 Pasta tossed with pesto and salmon for a delicious way to enjoy some healthy seafood. Make with traditional basil pesto as shown below, or use kale pesto if you like. Begin boiling water for the pasta. Place the garlic cloves in the food processor, pulse to mince. Add the remaining pesto ingredients–basil, cheese, olive oil and pine nuts– to the food processor. Puree until all the ingredients combined in a well-integrated sauce. Scrape the sides of the processor to get any chunk of basil or garlic that haven’t been incorporated yet, and briefly puree again. Set the pesto aside. Add the pasta to the boiling water and cook based on package instruction timing and testing for doneness. When the pasta is done, toss it immediate with 3 to 4 tablespoons of the pesto. Cover to keep warm while you finish cooking the salmon. As the pasta cooks, begin cooking the salmon. Make a quick marinade by combining the olive oil, rosemary, champagne vinegar and a pinch of salt in a large bowl. Rinse and pat dry the salmon. Place the salmon flesh side down in the marinade, then turn over and let the salmon rest for a few minutes in the mixture, skin side down. Heat the canola oil on medium high in a nonstick skillet. When the pan is hot, add the salmon skin side down. Cook for 4 to 5 minutes without moving the salmon. After this initial cooking time, carefully turn the salmon over with a spatula. Plate a serving of the pasta, topped with a portion of salmon, and an extra dollop of the pesto. Enjoy with a glass of white wine! I give the traditional pine nuts in the ingredients list, but since our home switched to nut free due to allergies, I now substitute lightly toasted pumpkins seeds. This works very well.